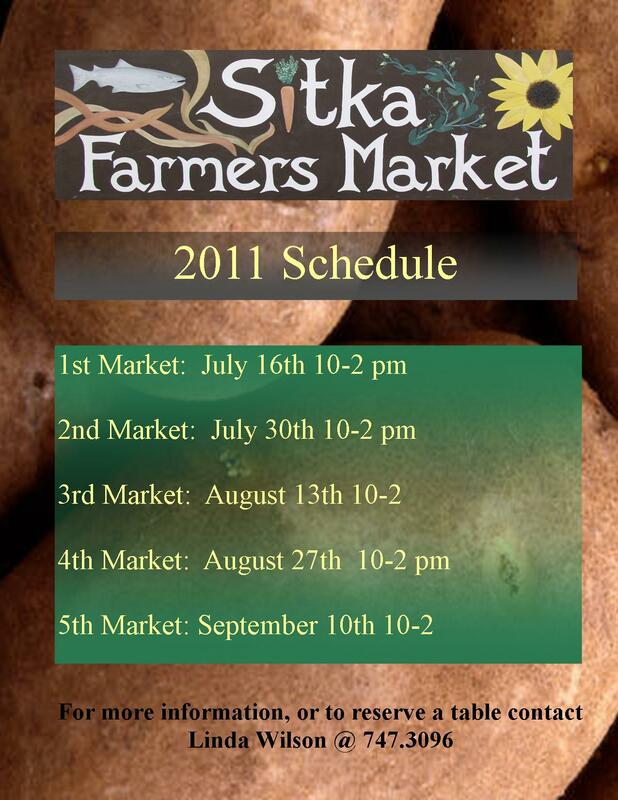 The 2011 Sitka Farmers Markets won’t start until July 16, but vendors need to start registering now to ensure they have booth space when the markets take place this summer. 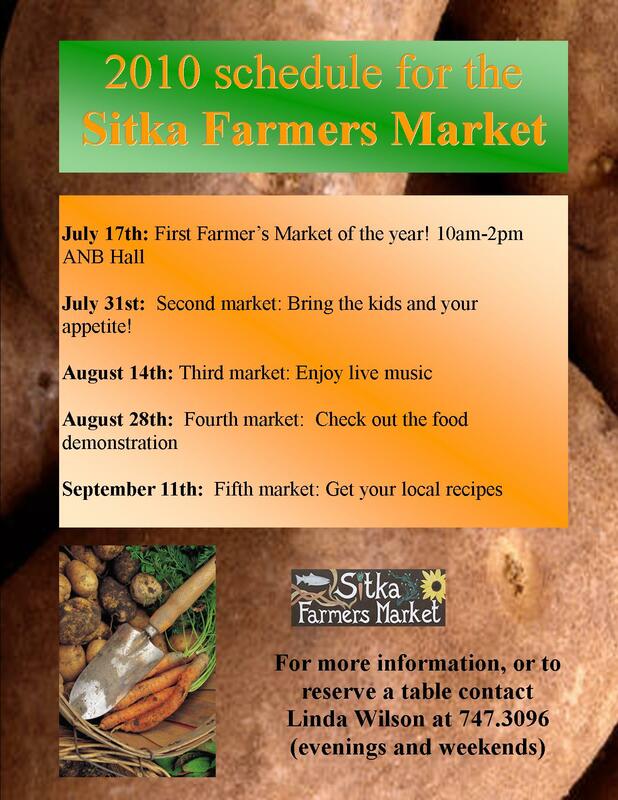 This year’s Sitka Farmers Markets take place from 10 a.m. to 2 p.m. on five alternate Saturdays — July 16 and 30, Aug. 13 and 27, and Sept. 10 — at the Alaska Native Brotherhood Hall, 235 Katlian St.
We really, really, need more locally grown produce vendors, home bakers, fish mongers, prepared food vendors and volunteers this year. If you know of someone who can help, please let us know. If you have extra locally grown produce but don’t have the time to staff a booth, you can donate it or sell it to the Sitka Local Foods Network for resale at the network’s Sitka Farmers Market booth. Proceeds from the produce sold at the network’s booth goes toward Sitka Local Foods Network projects. This year we had to raise the vendor fee to $2.50 a foot for table space or $2.00 per foot for vendors with their own outside tents to cover costs of renting the ANB Hall and kitchen, hiring musicians and other expenses. Now that construction is finishing on the Baranof Island Housing Authority office next door to ANB Hall, we expect to be able to have some booths outdoors in the parking lot again like we did two years ago. There is an option to get your vendor space free if you help out with set-up and clean-up. Space is limited so the earlier you register for booth space, the more likely we will be able to find a spot for you. The registration form and market rules are linked below as PDF files. If you have any questions, please contact Linda Wilson at 747-3096 (nights and weekends only) or by e-mail at lawilson87@hotmail.com. Due to construction, this summer’s Sitka Farmers Markets will have no outdoor vendor space. The Baranof Island Housing Authority (BIHA) is constructing a building this summer in part of the shared Alaska Native Brotherhood Hall/BIHA parking lot, and the parking lot will be closed off for safety and to store supplies. We will try to make as much room as possible available to vendors inside ANB Hall. We encourage vendors to create vertical displays so more people can share the tables. This year, the Sitka Farmers Markets are scheduled for 10 a.m. to 2 p.m. on alternate Saturdays, July 17 and 31, Aug. 14 and 28, and Sept. 11, at the Alaska Native Brotherhood Hall. Because of the space limitations, we may have to give our local food booths a limited priority over arts and crafts. The earlier you register for booth space, the more likely we will be able to find a spot for you. We really, really, need more locally grown produce vendors, home bakers, fish mongers, prepared food vendors and volunteers this year. If you know of someone who can help, please let us know. If you have extra locally grown produce but don’t have the time to staff a booth, you can donate it or sell it to the Sitka Farmers Market for resale at the Sitka Farmers Market booth. Proceeds from the produce sold at the Sitka Farmers Market booth goes toward Sitka Local Foods Network projects. This year we had to raise the vendor fee for a table to $15 to cover costs of renting the ANB Hall and kitchen, hiring musicians and other expenses. There is an option to get your vendor space free if you help out with set-up and clean-up. Due to construction, this summer’s Sitka Farmers Markets will have no outdoor vendor space. The Baranof Island Housing Authority will construct a building this summer in part of the Alaska Native Brotherhood Hall parking lot, and the parking lot will be closed off for safety and to store supplies. Due to space limitations, we may have to give our local food booths a limited priority over arts and crafts. The earlier you register for booth space, the more likely we will be able to find a spot for you.